Nvq3 qualified and numerous others ,last ofsted inspection rating good with outstanding areas MAY 2015 .please email for more information or advice .Drop off and pick up from Highlawn school and nursery . 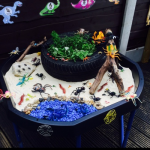 I provide home cooked nutricous meals ,outdoor learning experiences and work to the EYFS . All food , activities and outings included in fees . Parents to provide nappies, wet wipes and change of clothing , wellies and slippers. Childcare vouchers accepted.Also provide the 15/30 hrs funded spaces. Discounts offered for siblings . Below are the latest reviews for Rachael. Please note that reviews represent the subjective opinions of other Childcare.co.uk users and not of Childcare.co.uk. Parents must carry out their own checks and references on childcare providers to ensure that they are completely happy before enaging in the use of their services. We found Rachael when we moved to the area and she has been brilliant. Our daughter is very fond of her and we are confident that she is in safe hands. Rachael is very warm and friendly with an obvious love of children. She has extensive opportunities for play and creativity and a proven track record of excellent care. We would thoroughly recommend her. My 2 son's went to Rachel before and after school they both really enjoyed going there, her home is always spotless and she is very welcoming when i collected the boys. Rachel has excellent organisational skills and the boys enjoyed the arts and crafts, games and playing outside in summer. They always had healthy food there which my boys loved. I would definitely recommend Rachel, she's such a lovely person and made the boys feel welcome in her home. I have two children and have had childminders before. Rachael is the best child minder I've had and she takes care of my two children 7 and 2 as if they were her own. I had to increase my work hours recently and felt bad about it but my children are so happy with her it takes all the guilt away. She goes above and beyond and I can totally rely on her when things don't go to plan. Her house is perfectly set up for children of all ages. Her two children are a credit to her and it's clear to see from them what a good role model she is. As for her partner Mark my kids love him too. I would definitely recommend her. Rachel has looked after my daughter for the past 6 years. She offers a very professional service that is friendly and welcoming to children of all ages, and to the parents. She encourages a wide range of activities which have helped in the development of my child as a toddler and now whilst she is at school. There is a fantastic bond between Rachel and the children, making them feel like they are apart of her home, my daughter often wants to stay longer than scheduled because she enjoys herself there so much. Rachel supplies all home cooked meals which the children enjoy. I highly recommend Rachel as a childminder if you want an excellent service which is friendly, caring and reliable, she will always go that extra mile to fulfil your requirements.